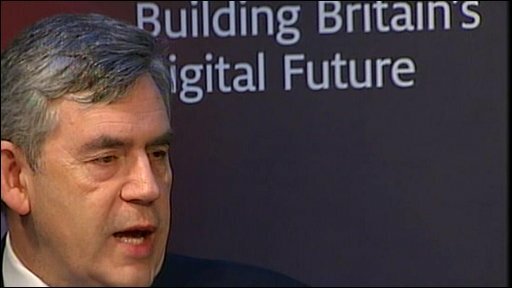 Gordon Brown: "The next generation web ... will change fundamentally the way we conduct business"
Gordon Brown has said Labour plans to give every home in the UK access to super-fast broadband. In a speech, the prime minister called high-speed web access "the electricity of the digital age" which "must be for all - not just for some". The Conservatives say they have made a similar pledge and have attacked a £6-a-year landline levy planned by Labour. The PM also promised to create a single website bringing together all government and public sector services. The "MyGov" portal will allow people to manage pensions and benefits, pay council tax, apply for school places and jobs, and book doctors' appointments online. Mr Brown said it would end the "one size fits all" style of public services and would help the British government become "the most efficient, open and responsive" in the world. The PM also said Labour planned £30m of funding for a new Institute of Web Science, to be based in Britain and jointly headed by Sir Tim Berners-Lee, inventor of the world wide web. And he announced the creation of a digital Domesday Book, bringing together information about life in Britain today. In his speech, Mr Brown set out his plans to make Britain "the world leader in the digital economy" by 2020 - although there was no date set to provide the faster broadband for all homes. He argued the change would bring in cheaper and better public services, create more sophisticated entertainment and make trading easier. Leaving this to the market alone would lead to coverage "determined not by need or by social justice, but by profitability" and "a lasting, pervasive and damaging new digital divide" would result. Superfast broadband is generally regarded as speeds of 50Mbps (megabits per second) or above, but recent research suggests the majority of UK users currently get between 3Mbps and 4.5Mbps. Labour has already pledged to guarantee nearly every household access to at least 2Mbps by 2012, but Mr Brown said he eventually wanted to increase that to 100% access to super-fast broadband. The government is planning a 50p-a-month levy on landlines to prevent rural areas missing out on a fast network. But the BBC's Rory Cellan-Jones said there was still scepticism among rural inhabitants about whether the pledge was realistic. In their "technology manifesto", the Conservatives have pledged to give Britain the fastest high-speed broadband network in Europe. The party has promised to put more government services online and to publish more government data and contracts. Shadow culture secretary Jeremy Hunt said: "The [government's] phone tax is misguided, dangerous and unnecessary, which is why we have pledged to scrap it. "The government's own figures suggest that this tax will make the internet unaffordable for hundreds of thousands of people and will especially penalise low-income families. "This makes a complete mockery of Gordon Brown's boasts today about promoting universal access." Liberal Democrat culture spokesman Don Foster said: "Investment in rural areas must start early to avoid an expanding digital divide. "The government must provide exemptions from the tax for pensioners and the least well-off and ensure everyone is equipped with the skills to use super-fast broadband." Digital campaigners the Open Rights group said Mr Brown's plans were incompatible with provisions in the Digital Economy Bill, which is currently going through Parliament, to cut off persistent illegal file-sharers. Executive director Jim Killock said: "Online government is a great idea, but Labour cannot say people will depend on online government, and simultaneously plan to disconnect families after allegations of minor copyright offences." There has been particular objection to clause 18 of the bill which would give courts the power to shut down websites which infringe copyright - but minister for digital Britain Stephen Timms said the government believed it would be "able to allay those concerns". He said it would be bringing forward a replacement clause "which will require extensive consultation before then introducing regulations addressing some of the points that the current clause 18 addresses". He said there would be an appeals process and "no disconnection until the appeal is heard". "Our hope is that we will not get into technical measures at all because the [other] measures the bill sets out, letter writing and so on, will significantly reduce the extent of unlawful downloading that's under way at the moment." Unions have expressed concern that thousands of public sector workers could be made redundant if more services are digitised, and that more personal data belonging citizens could put at risk. Mr Brown said government had to be "very careful that we balance the civil liberties questions with the need for people to get access".